KATY AND RICH HARJES CAN PINPOINT the precise moment where they took the fork in life’s path that led to their present situation. 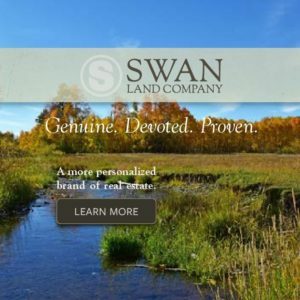 In 2005 they bought 170 acres of rolling pasture roughly 10 miles north of Bozeman, along the foothills of the Bridger Mountains. In 2008 they sold their home in Chicago and moved into a trailer while they renovated the 100-year old farmhouse. At the time they had only a vague notion of their hopes and intentions. It didn’t have to go that way. Rich had a lucrative career in teaching and the financial sector going back almost 20 years. Katy was a photo editor. They had achieved a level of success and security many Americans would envy. They could have parlayed that into a comfortable retirement, indulging their passions for kayaking and bicycling, healthy food, travel, realizing a life of leisure and adventure. 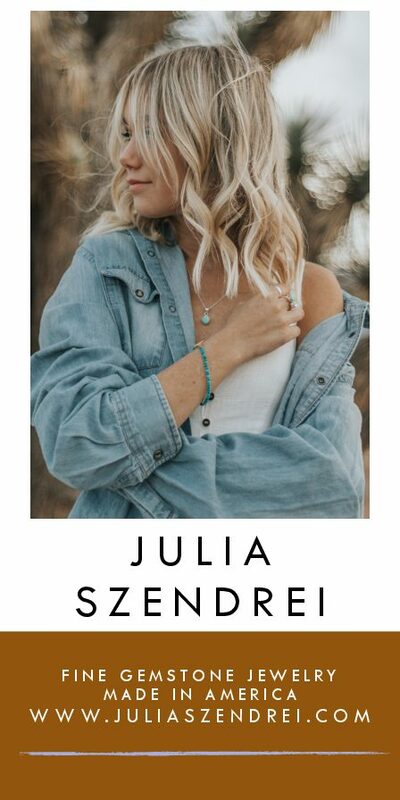 Instead they moved into a trailer and started a second career that has consumed them ever since, and which has cut them off from many things they used to enjoy. Ironically, neither of them thinks of the trade-off as sacrifice. With time, things began to reveal themselves. And the land had its say. “It’s too high for large-scale gardening, the soil and terrain aren’t really right for that. This is pasture,” says Rich. They started focusing on raising stock, going organic. They met the neighbors, talked to people. They dove into the challenge of certifying their land. They kept working on the house, fixing the outbuildings. They had dinner with neighbors who had more than a decade of experience raising sheep organically. Turned out that they had a flock they wanted to sell. Suddenly the fantasy snapped into tangible focus. The Harjes weighed the opportunity. They were daunted, didn’t know if they were ready, but it seemed too good to pass up. At the end of 2008 they bought 100 pregnant ewes, their starter flock, and life hasn’t been the same since. Problem is, with this sort of thing, everything has to happen at once. It isn’t simply that there are sheep on the property. The organic certification has to be in place. The sheep need herding and protection. They need fencing. The building projects are constant. You need a business plan, extra pasture to lease. You decide to raise chickens to supply local restaurants with fresh eggs, so you pick up 100 layers. Before long the juggling act makes stock trading look pretty simple and pedestrian; the hours are still dawn to dusk. FOUR YEARS AND THINGS ARE STILL ROCKETING AHEAD, the juggling act, if anything, has more balls in the air, but there is a sense of confidence and conviction behind the enterprise, and a gathering vision of future possibilities. Willow Springs Ranch Montana has grown to roughly 350 ewes and 20 rams, five horses, 100 chickens, two house dogs, three herding dogs and six livestock guardian dogs. The house is done, along with a workshop, chicken coop, lambing barn, and garage. The Harjes lease 100 acres of extra land to raise hay and another 1,600 acres of organic pasture near Whitehall. They spent the better part of three years getting everything certified. That’s the backdrop, the invisible foundation without which none of this would be possible. What is visible, and what gets your attention, is the dogs. On an early spring morning, the pasture rolls away under gray skies. In the cool, squally day, wooly puffs of sheep dot the view, and mixed in, the larger spots of white, the dogs. They lie on the fringes of the herd, or amble slowly among them, huge and deceptively relaxed-looking. Four of them are Maremma, an Italian breed that look much like Pyrenees, bred for their combination of gentleness with lambs and fiercely protective instincts. Two more, Smiley and Burke, are Akbash, one of several massive Anatolian breeds known for their ability to take on wolves and bears. They lumber around the fields, 150 pounds of vigilance. Friendly enough, even playful, but when evening comes on, with the threat of coyote and mountain lion, they are all business, alert and tense. It’s as if, at dusk, they punch the clock. Most of the day the dogs roam the fields with the sheep, alert to the passing shadow of golden eagle, the scent of predators, to any sign of agitation in the flock. They live with the sheep 24/7, literally become one of them. “The sheep will be all bunched up, resisting going through a gate, but as soon as they see a dog go in, they all run after,” Katy adds. Along the Bridgers the main threats to livestock are coyote and mountain lion. Wolves may be in the region occasionally, black bear come and go, eagles might take a lamb if the chance presents itself, but coyote and lion represent the most constant peril. The first year, before they started using dogs, the Harjes lost 15 of 250 sheep. This past year they lost 2 of 550 sheep, and one of those was to an eagle. “The drop in predation has been linear,” says Rich. The Harjes credit the dogs with “training” the lions and coyote to stay clear. Every season of the year presents challenges, but when it’s lambing time everyone is vigilant. The lambing barn is chock full of ewes in labor, newborn lambs finding their way to teats, bleating life, groaning, straining mothers, the mess of it all, the surprise, the miracle. Rich and Katy and the hired hand, Jake, hover over the chaos, helping when necessary, watching, fencing off new birthing ‘jugs,’ moving animals, checking the pasture. The care and attention they give each ewe, each fresh lamb, epitomizes their approach to raising livestock. “Losing one animal is a big deal,” Katy says. Last spring one of the ewes died in childbirth, leaving orphan twins. “She was one of my favorites,” Katy remembers, still mourning. And there is nothing distanced about the loss. The Harjes took over bottle-feeding the lambs after the mother died. In other cases they have had to skin a dead lamb and drape the hide over an orphan to trick the nursing mother into adoption. The Harjes pay close attention to it all. Which ewes are the best mothers. Who tends to have twins. Which breeds have the greatest success. This level of attention to individual animals, exhibits itself throughout the operation. The rams and a few more notable sheep have names: Tater Tot, Squirt, Whitey. To lose one is personal. It’s personal at butchering time as well. “I spend time with the lambs on butchering day,” says Katy. “I thank them. I cry. It is that sense of community, and of purpose, that feeds the Harjes’ vision of the future. What the Harjes have in mind is a network of social entrepreneurship based on the model they’ve developed. “We want to connect with motivated young people, absentee landlords, and others in agriculture who are attracted to this approach,” says Rich. “We would operate as consultants for them. We’d provide the starter herd, maybe 100 pregnant ewes, and we’d help them get their property certified organic. Then, after they raised the lambs, we’d commit to buying back the meat and taking care of the marketing. Bella and Suvi (far left) are sibling Maremma sheep dogs guarding the flocks of sheep at Willow Spring Ranch north of Bozeman, though smaller, Bella is the dominant of the two dogs. 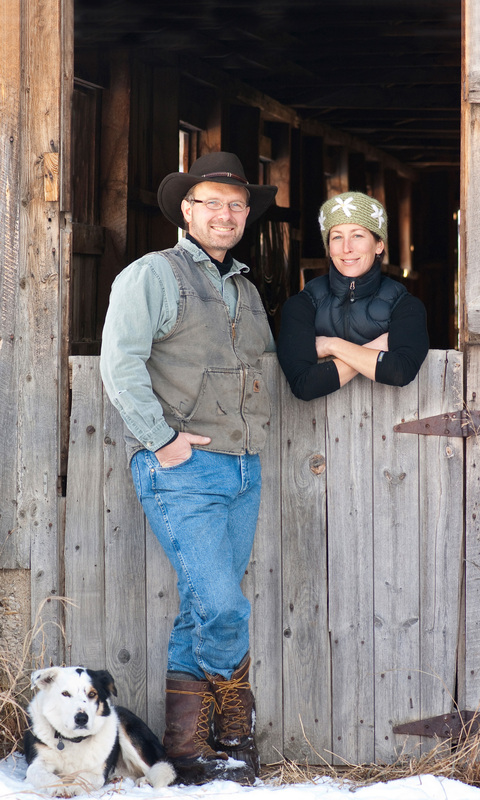 Richard and Katy Harjes own Willow Spring Ranch north of Bozeman, Mont. The couple raises organic lamb and employs border collies like Fat Boy, pictured, to work the sheep. 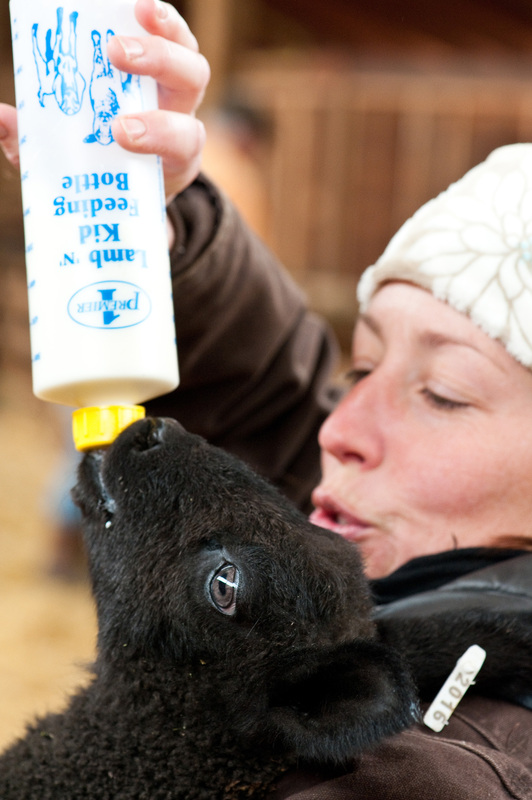 Katy Harjes gives an orphan lamb a good pull on the milk bottle during lambing in the spring. 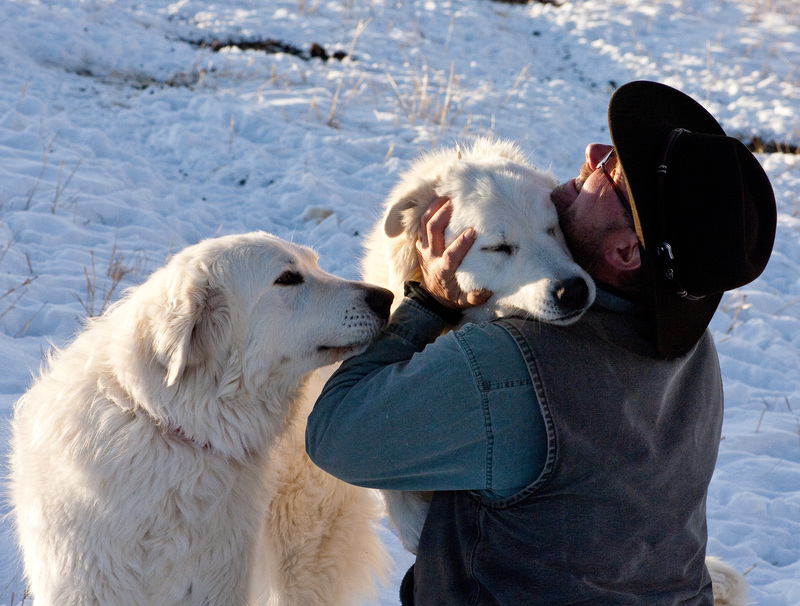 Richard Harjes is greeted by two of his Maremma sheep dogs at feeding time, just before sunset. The dogs are fierce guardians, but affectionate to people they know. 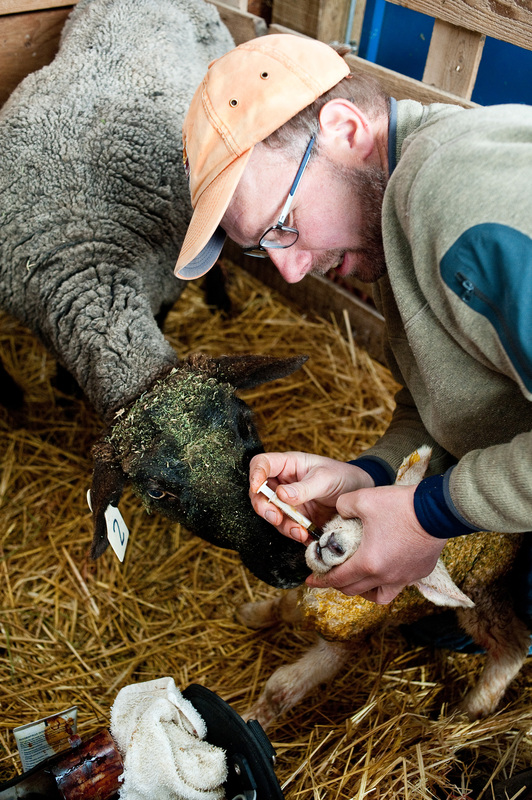 Richard Harjes gives a newborn lamb a dose of a molasses mixture while the ewe begins to clean the lamb.